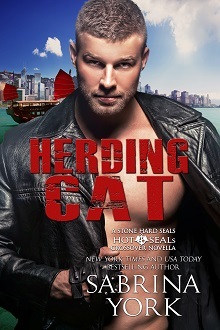 Another installment to catch up with the boys from the Hot SEALs world, with Kindle Worlds from Sabrina York. Full of humor and steam, please read on for my review of this sequel to Guard Dog. If you want something on the lighter side for entertainment, with characters that you can enjoy and perhaps even lust over for a moment, you won’t go wrong with Sabrina York’s Hot SEALs stories. Alpha heroes completely used to getting their own way, perhaps even priding themselves on the fact that their approach and bearing instills fear into many come up against smart-aleck heroines who not only are not afraid of them, but rarely concerned with consequences. Poor Garrett: all that muscle and brawn backing up his ability to appear menacing and she just doesn’t get it. Doesn’t realize that he’s big and bad and dangerous, and she’s merely a crudité in the buffet that is women lining up for his special treatment as their bodyguard. Oh he’s not unprofessional, but intrigued by the woman who won’t take her situation or safety seriously, and does she HAVE to look so delectable? Catherine has plans and meetings and none of those include the hulking men that are attempting to tell HER what to do. Never good at taking direction, she’s agreed to the contingency but believes it unnecessary. Until she finds herself coddled in the arms of Garrett, when one of her team is run down by a car aiming for her. Of course, it was coincidence and she’s not going to change her plans or her life for this. But, the incidents become more threatening and a tiny pickpocket with street sense that is far beyond her years become integral to the story and fuel the battle between Catherine and Garrett. Oh there is no doubt she’s not thinking straight when his scent and presence surround her, and feeling safe, desired and protected is an unfamiliar place. But, she can’t deny the sparks, and he can’t deny that she is all he wants and then some. Now they need only to negotiate every movement, avoid the bad guys, explore this connection (repeatedly) and see if they won’t find a happy ending. Fun, funny and fast-paced, you’ll enjoy the banter, need an icy cold beverage for the steamy moments and wonder just how you lived without this story for so long. A great little series when you need some feel good reading to perk up a grey day.